New year, new you. That’s the message this fall from the 12 community colleges in Riverside and San Bernardino counties, which are expanding their career education programs and launching new initiatives to help area residents find good-paying jobs in high-demand professions. • San Bernardino Valley College has a new, accelerated program in electronics technology that students can finish in just eight months, instead of two years. Program grads will be well-versed in everything from voltage analysis to digital logic design – an essential skill for developing cell phones, computers and other electronic devices. On average, workers with an electronics technology certificate go on to earn an annual salary of $47,000 two years after graduating and $55,000 five years after. • The Manufacturing Technology program at Norco College was awarded a $95,000 grant from the Dart Foundation to purchase a new Y-Axis Computer Numerical Control lathe for its Advanced Manufacturing Lab. More than 800 students each year use the lab, and the new lathe will ensure that students have access to industry standard equipment. The Manufacturing Technology program provides students with the training needed to compete for high-paying jobs in the manufacturing industry. • The InTECH Learning Center in Fontana, launched in March of 2016, continues to build on its earlier successes. The InTECH Learning Center is a public-private partnership between Inland Empire community colleges and California Steel Industries that is designed to increase the number of well-trained manufacturing workers in the advanced manufacturing sector. Chaffey College is the lead institution, with additional community college partners including Barstow, College of the Desert, Crafton Hills, Mt. San Jacinto, MiraCosta, Norco, Riverside City, San Bernardino Valley and Victor Valley. The InTECH Center was one of three regional public-private partnerships for workforce development to be honored for their accomplishments at the 2017 California Economic Summit in San Diego. The InTECH Center was hailed for involving community colleges, the Manufacturers Council, and workforce agencies in both San Bernardino and Riverside counties. The InTECH Center’s long-term economic impact in the Inland Empire is estimated at $168 million. • Crafton Hills College has expanded its Three-Dimensional Design course and launched a new Multimedia Art Certificate program. These programs train participants in the skills that will lead to successful careers related to engineering and design. The first cohort of classes began in the fall of 2017. 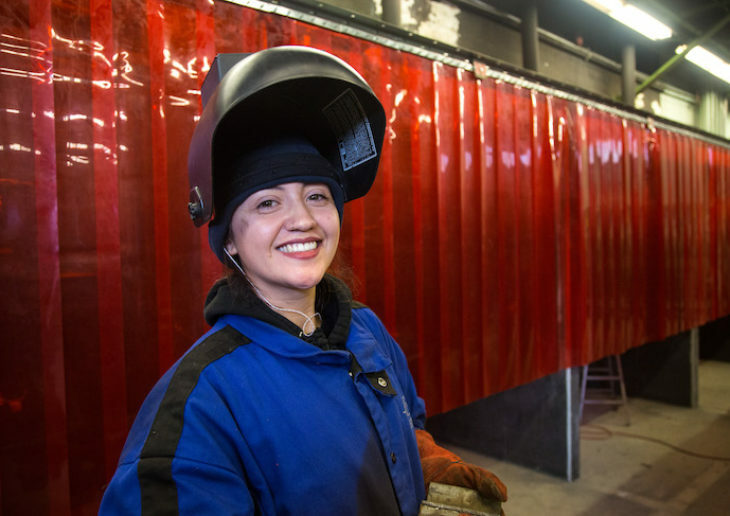 • Victor Valley College’s Welding Certificate credit program is booming, in large part to a new welding training facility – complete with high-tech equipment – which is fulfilling the needs of local employers who are hiring graduates of the program. Last year, Victor Valley College’s Welding Certificate program served more than 430 students. The College is working with local partners to develop education and training centers in existing and emerging industry sectors, including: Digital Media and Film; Hospitality and Culinary Arts; Healthcare; and Sustainable Technologies. In January, College of the Desert announced a partnership with DIGICOM to create a Center for Digital Media Education as a cornerstone of the new campus. Internships were already being offered in partnership with the Palm Springs International Film Festival, hospitals and local wind and solar companies.